Everybody loves crispy on the outside-soft on the inside french fries. By slicing the potato very thin, and soaking them in water before frying, you get just that. Just a pinch of salt is all they need, and you’ll be hooked. Heat 2 cups of vegetable oil in a wok or large pot over medium high heat. Wash and slice the russet potatoes into thin slices (about 1/4 of an inch thick). Place the sliced potatoes in a bowl of water while continuing to slice up the the rest of the potatoes. Once done, rinse potatoes 3 times in cold water. Lay sliced potatoes on paper towel and pat until dry. The drier your potatoes, the crispier they will be. Once your potatoes are dry and your oil is hot (about 375 degrees on a candy thermometer) put 1/3rd of the potato slices in the hot oil. Stir every so often, cooking until browned and crisp on the outside (roughly 8-10 minutes). Remove from hot oil with tongs and place on paper towel. Sprinkle with salt and fold up paper towel around the french fries. 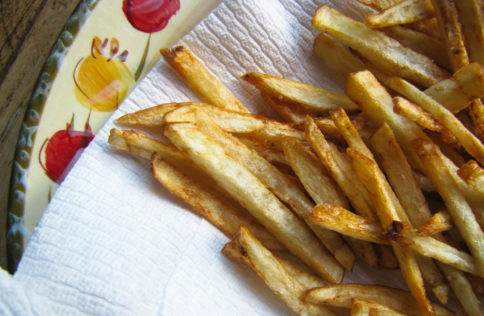 Shake the fries in the paper towel to remove excess oil and distribute the salt. To keep warm while making the other 2 batches of french fries, simply lay the french fries on a cookie sheet and place in an oven preheated to 325 degrees. Serve with ketchup or garlic mayonnaise (mayonnaise mixed with 1 tsp mustard, 1 tsp chopped garlic, 1 tsp lemon juice, and 1/2 tsp of salt and pepper). hmmm…next time I’m going to have to try your garlic/mayo mix. Those ingredients would go really well together so I can imagine how tasty it would be on your homemade fries. Everything tastes better from scratch.